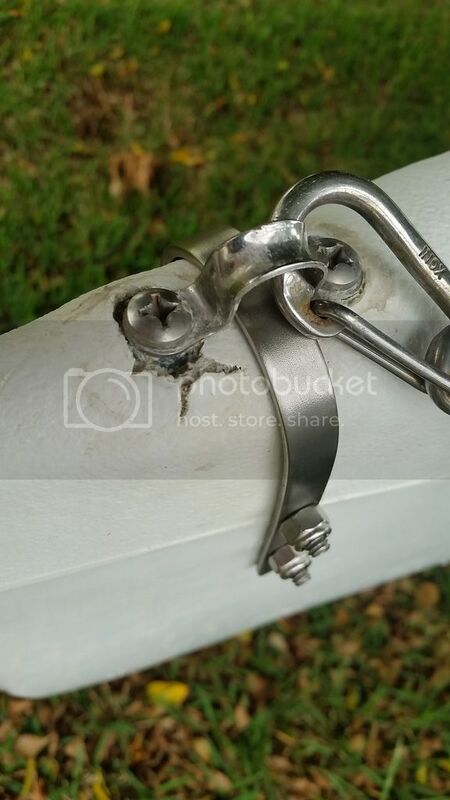 While replacing a bridle eyestrap, the bolt has been epoxy set into the anchor, and I ended up breaking the bolt in the anchor. While trying to drill out the bolt, the bit snapped. It is taking forever to drill out and try to re-tap. That would require something different to fix. Maybe bolts through the hull from side to side below the insert to mounts a bale or strap to hang the bridle on. This is the idea, but since one bolt is sheared. Mount a strap up a bit to hook the bridle direct.